» All those awful hurdles to voting! All those awful hurdles to voting! How archaic! Here is one obvious ploy to disenfranchise whole generations. Voting in Oregon is such a horrible burden. You get a ballot in the mail and they actually expect you to return it so it can be counted. What an imposition! The legislature is considering a bill to make it less of a chore, but even with this change voting will still require some work. By requiring public colleges to do more in connection with elections, Senate Bill 1586 is supposed to help particularly college students, who we know are so overburdened with life they cannot be expected to pay any attention to the fundamentals of a republic. The bill also says the state must supply a postage-free return envelope for all ballots. This would save us all 49 cents for every ballot we mail. As for the state, the Legislative Fiscal Office estimates the added cost at $1.8 million for the 2017-19 biennium. And then, mailing the thing! Or even worse, having to find an official ballot box to drop it in. All this work just to vote — it’s an obvious ploy to keep busy citizens from participating in the democratic process. Especially young people, who have so many other things to do. Videos to watch, social media to feed, texts to answer and send, and all the rest. How can we expect them to handle all this stuff with paper ballots? So SB 1586 can’t be the end of it. If it is, entire generations will be excluded from a basic civil right, the right to vote. I only see one teensie little problem with this. The sarcasm will go right over the heads of those trying to implement this. They will take it as support, then see how fast they can conjure up the app. As usual you are spot on with your commentary. Unfortunately there are too many ignorant fools out there to truly appreciate it. Usually I’m not keen on your right-wing tirades, and generally reducing barriers to democratic participation is a good thing. But Oregon has done a good job already in this arena, and I don’t think spending $1.8M on postage is a necessary subsidy to ensure the franchise to even the laziest and cheapest potential voter. Electronic voting? Whatever could go wrong? I mean those “butterfly” ballot machines were so diabolical eh? Another government freebie? Far out. I feel the Bern. An app would require skilled programmers and competent IT managers. The powers that be might still be a bit nervous about undertaking any project that requires either of those. To me, the solution is obvious– paid election workers will stop by your home and fill out the ballot for you. After that proves to be a success, the next logical step is to skip the hassle of mailing, and have the ballot filled out for you in Salem. No muss, no fuss! An APP would not make any difference. If one did not care nor have the “time” or interest in voting at the POLL they probably are the same about the current mail in system. They will just as ambivalent about putting an APP on their phone. Given the amount of money and effort that has been sent to suppress voting across the nation, we’re lucky to be here in Oregon. Sarcasm is ok Hasso. I have long resisted the temptation to respond to this blog – but I cannot resist this time….. I have been always been fascinated by the compulsion among many in the human race to make otherwise easy tasks into a struggle. I always think about those religious pilgrims who will travel thousands of miles to visit a beloved religious shrine, then crawl on their bellies for the last several yards to reach it. I guess it’s a way to show devotion or love or some such thing. It always seems a little silly to me. I see the same thing in this notion that voting should require some sort of effort or other – in this view that it shouldn’t be easy. I think I have a solution for Hasso. 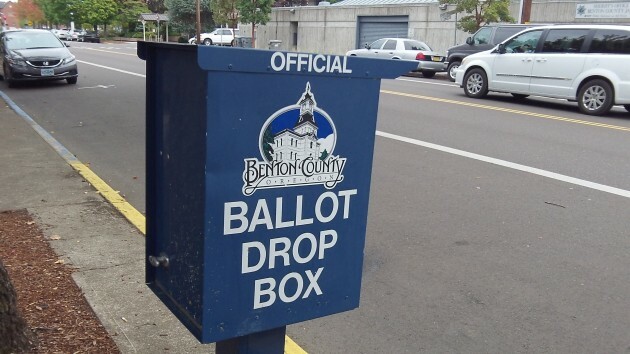 He can fill out his ballot, drive downtown, park about a mile or so away from the courthouse, then walk, then get down and crawl on his belly for the last several yards to the ballot box behind the courthouse, then deposit his ballot in the box. That way, he can satisfy his need for ritual, his need to show his “devotion”, his need to consider voting to be something “meaningful” to him – it would satisfy all of his “whatevers”. And it avoid this nonsense of him (and folks like him) imposing all of his “whatevers” on all the rest of us. We could then cast our ballots in whatever way works the best for us.